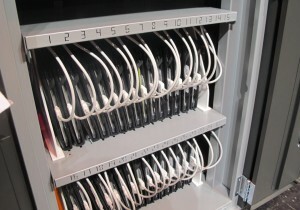 Charging carts are used to image iPads for use in the classroom. The program will be one-to-one, meaning the district will have one iPad for each student in those grade levels at all seven of its elementary schools for the 2013-14 school year. The district is targeting having iPads available for all students by the spring semester. Each third- and fourth-grade classroom would have its own cart of iPads. The devices will be leased for four years at an annual cost of $214,000. Huddle said those funds will come from Title 1 funding. An increasing number of Indiana school corporations have launched one-to-one programs in recent years. Changes to how the state’s textbook fund is administered in 2009 make it easier for districts to buy technology with money once earmarked for paper books. The programs are most common in the upper grades, where middle and high school students get to take the devices home. This can help teachers “flip” their classroom, pre-recording lectures to give students more class time to work on assignments and projects.